Only a momentary lapse in kavannah. Is one's Da'as Torah diluted or enhanced by youthful ventures into the thought of Kant? Time for an old-style On the Main Line Artscroll post. Note, this shows that the influence of Kant's Critique of Pure Reason on R. Elchanan's thinking is a clear possibility. By the way, Kant advocated a severe reform of Judaism, including the abolition of most mitzvos as a prerequisite for granting Jews civil rights. I suppose this may be construed as some evidence that R. Elchanan was of the opinion that one may accept the good and discard the bad of thinkers. Secondly, he read the newspaper in the beis midrash?! I see I was preceded in the second part of this post by two years (link). As long as it's not Handel's Messiah, right? Here's an interesting notice from the Annual Register of 1766 about the dedication of the newly built Duke's Place Synagogue in London. The chief Rabbi who pronounced the benediction in English was none other than Rabbi David Tevele Schiff, who was in fact the rebbe of Rabbi Nosson Adler (the Chasam Sofer's rebbe, link). You can listen to Handel's coronation here. What the Chida said about 11 year old Rabbi Nosson Adler's lateness in schule. Auerbach's father was a student of Rabbi Adler, so one presumes he heard it from him. A really odd Godol story about Rabbi Nathan Marcus Adler, Moses Montefiore, and Queen Victoria. VICTORIA, QUEEN OF THE BRITISH EMPIRE, HAD good reason to be grateful to Nathan Adler, who was rabbi of a shul in Hanau (Hanover), where the queen had come to visit. Her husband, Prince Consort Albert, was from the duchy of Saxe Coburg Gotha, and her own ancestors had originated in Hanover. The royal couple had arrived there for a vacation before the expected birth of their first child, when suddenly, labor began two months earlier than expected. The great Jewish shtadlan, Moshe Montefiore, a financial advisor to the British government, came to the Court at Hanover at that crucial moment. The doctors and members of the Court were at their wit’s end -- if the child would be born on German soil, his succession to the throne might be in question, since he would be considered a German citizen and would not be eligible for the crown. 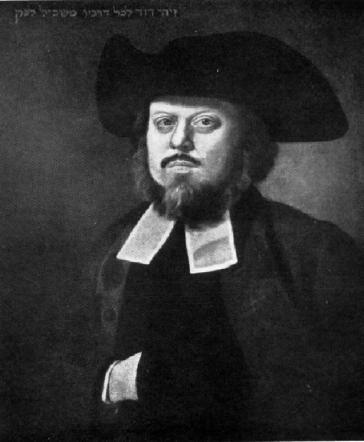 Rav Adler suggested that the Queen be brought immediately to an English ship, which should then travel out three kilometers from the German shore to international waters. A child born on the British ship would be regarded as having been born on English soil. Sir Moses quickly relayed this advice to the Court, and Queen Victoria was rushed to the famous British warship, the Arc Royal, which was nearby. That night, she gave birth to a son. He duly became known later (much later, since the Queen ruled until her death at the venerable age of 82) as King Edward VII. A sticky situation was averted by the ingenious rabbi of Hanover, and the Queen did not forget that. Years later, Queen Victoria’s attention was directed to an announcement issued by the Dukes Place shul in London, requesting applications to be submitted for the prestigious position of rabbi there. This was publicized internationally, and many renowned rabbanim applied, including Rabbi Samson Raphael Hirsch and others. The Queen sent a note to the synagogue, stating, “Since Rabbi Adler saved me when I was in trouble, he will certainly be the right guardian and leader for your congregation.” And so it was. When the Queen’s advice was accepted and Rav Nathan Adler was chosen as the rabbi of the Dukes Place shul, she further suggested that this position was not enough -- he should become Chief Rabbi of England, or better yet, of the British Empire! A bill was raised in Parliament in order to decide whether the Empire required a chief rabbi. When put to a vote, a substantial majority chose Rav Adler as Chief Rabbi of the British Empire, a post he filled with honor and distinction for 45 years. Thus Queen Victoria repaid the good advice of the rabbi of Hanau. Her reign was an era of good feeling toward her Jewish subjects, who prospered and enjoyed more rights and freedom than any of their brethren in the European countries. Paper read by Mr. Marcus N. Adler, at the Jewish Institute in London, on the 6th of June, 1909, on the occasion of the Jubilee of the Chief Rabbi. Reprinted from the JEWISH CHRONICLE. Luckily this gives its source, namely "(From “THE ADLER FAMILY -- ITS GENEALOGY; WITH SOME REMINISCES”) described as "Paper read by Mr. Marcus N. Adler, at the Jewish Institute in London, on the 6th of June, 1909, on the occasion of the Jubilee of the Chief Rabbi. Reprinted from the JEWISH CHRONICLE." As it turns out, The Adler Family - It's Genealogy with Some Reminisces is available to read or download. Now, I was expecting some variation of this story to appear in it, but although there is a section on Montefiore, nothing even remotely like this story appears. I figured I'd better look up the paper in the Jewish Chronicle, since this pamphlet was reprinted from that newspaper. Sure enough, the entire speech is printed in the June 11, 1909 issue, but it is identical to the pamphlet, which you can read yourself quite easily. So what gives? Now, the story is strange for a number of reasons, not the least of which is that there seems to be no record or hint that Edward was born on a British ship. In fact, his page on Wikipedia says that he was born at Buckingham Palace. Furthermore, he wasn't Victoria's eldest, but her second child. It is entirely possible that some sort of Adler family legend to this effect existed, but it surely wasn't mentioned by his son Marcus Nathan (who does mention family lore that they are descended from the compiler of Yalkut Shim'oni -- however, he examines that claim critically, as his father no doubt did or would have). In fact, the source is probably from outside the Adler family, I imagine. The oral source the author gives, HaRav Yitzchak Kaufman" of B’nei Brak, who is married to a descendant of Rav Nathan Adler" relates that he heard this from Rabbi Moishe Schneider in a mussar schmuess long before joining the Adler family. It may well be that the 300+ strong Adler yungeleits in B'nei Brak tell this story, but it seems to me more likely that it came to them through mussar schmuessen and the like rather than from anything that the family patriarch ever said or did. That said, IIRC the Chief Rabbi was known to the royal family from his Hanover days -- a historian writes that "Whilst Rabbi in Hanover, he became acquainted with Prince Adolphus, Duke of Cambridge, regent of the province, who is thought to have recommended him for the post of Chief Rabbi in Britain" -- and perhaps Victoria did pen a note to the Duke's Palace synagogue supporting his candidacy. Maskilic zemiros in 19th century Lemberg. I was reading the extremely interesting עראינערונגען פון מיין לעבען (1936) by Joseph Margoshes (1866-1955) (which was recently translated into English and published as A world apart: a memoir of Jewish life in nineteenth century Galicia. One of the interesting things about this book was to read about the early life led by a man who died in 1955, which in many respects differed little from life in Galicia in the 18th century. Parts of it reminded me of Salomon Maimon's autobiography; not in the skeptical/ heretical sense; only in the description of rural life in eastern Europe in what was still essentially under the serf system, being married at 15, etc. His great-grandfather was the last secretary of the Va'ad Arba'ah Aratzos (which folded up shop in 1764), and his father was one of the founders of the rigid Orthodox Machzikei Ha-das Society (see Rachel Manekin's PhD dissertation). Margoshes describes what life was like growing up in the upper stratum of Galician Jewish society, as he reminds the reader on almost every page. The shaleshudesn in Reb Votshi's Kloyz were really impressive. We lived not far from the Kloyz. My father would come home right after Mincha, wash in preparation to eat, and taking with him some requisite ritual amount of challah bread, return to the kloyz and spend time with everybody. For shaleshudes everyone would usually drink mead. It always ended up that some balebos "was required to provide liquor" and soon a "big zaddik" or at least a "small zaddik" of mead would appear (a "big zaddik" was a bottle that held 90 glasses of mead, and a "small zaddik" only held 60). People would comment on the Torah, sing zmires, and each zmire had its regular singer. Reb Shmuel Shaynblum, Reb Vovtshi's son, had a nice, pleasant voice. And because he was a maskil, he sang the zmires that had been composed by the great old Hebrew poets, Rabbi Abraham Ibn Ezra and Dunash ben Labrat, i.e., "Ki eshmera shabbos" and "Dror Yikra." He also writes that because there was a special tax (or, deposit, really) which was required by the authorities for weekly newspapers, it was the practice of weeklies (Jewish and non-Jewish) to change the name of the paper slightly every other issue. For example, one week the Machzike Ha-dos would be called by that name, and the next week it would be called Kol Machziek Ha-dos. The government was aware of it, and turned a blind eye, unless someone lodged a complaint, which is how some newspapers were shut down by opponents. A youthful letter to the Jewish Chronicle from Rabbi Louis Jacobs called "College of Yehiva," and responses. Now that haloscan is about to bite the dust, any suggestions? I really dislike the JS-Kit alternative that is being forced upon me. Did I say I dislike it? I hate it. Anyone have any other suggestion? Should I just use the built-in blogger default? The 1850s Vilna Biur with the names of the Tzemach Tzedek and R. Itzele Volozhiner in it. Click to enlarge. Worth a read. Test question for theology students in 1837. "Blockhead of a bookbinder," book inscriptions yield amusing reading. I came across a pretty funny inscription in a Pentateuch printed in 1710, written by its owner in 1880. He probably spent some good money to give this holy book a good binding. Evidently his bookbinder messed up. William G. Barrows (1821-1886) was a Maine State Supreme Court judge. It also includes a section on chess, as well as many other nice pictures of people like Adler's father, Heinrich Graetz, Zecharya Frankel and the Netziv. A sugar deprived Chanukah for the children of 1917. I would be remiss if I did not mention the passing of Prof. Yosef Hayyim Yerushalmi this week. The truth is that he was not influential to me in ways that some others historians/ academic scholars are, although I used his book about the marrano physician Cardoso in a post that I've been working on for a few weeks, and I'm proud of. (Stay tuned.) However, he will always hold a special place in my heart and mind because of his book Zakhor; Jewish History and Jewish Memory. I can't even think of what it was specifically about the book that moved me, but it was very exciting when I read it, as it was the two or three times I reread it. One haunting sentence in the book stands out to this very day: "...History becomes what it had never been before--the faith of fallen Jews." (pg. 86) In addition, I thought his prose in that book was gorgeous. Lord George Gordon's correspondence on Jews and beards, along with some other Gordon-related material. Here are some interesting notes relating to Lord George Gordon, infamous 18th century English convert to Judaism (please see these earlier posts: I, II and III). First, here is an engraving of Lord George (and a woman he was associated with), which appeared in Town & Country, June 1786. Although it is not known for sure why he was nicknamed Lord Crop, it has been speculated that it was because he was circumcised. However, if so, then it becomes clear that it was widely known that he had become Jewish by 1786, while for other reasons the date when he converted is not clear. “Gar-Zadak, My Lord, The letter which your Lordship thought proper to honour me with, will for ever merit my best acknowledgments, as I am thereby made superlatively happy, in finding that the solid reasonings therein perfectly agree with my heart, and are conformable to the directions of Almighty God, and to the sacred writings of our prophets. “I beg leave to declare for myself, that owing to your Lordship’s few words and personal example, on the tenth of June, when I had the honour of waiting upon you, I took the resolution not to shave any more, which the bearer can personally testify. The third concerns a point I once made about time. The correspondent, writing in 1905, remembers that his grandfather told him all about the Gordon Riots of 1780. A portrait of the Chida's grandson. 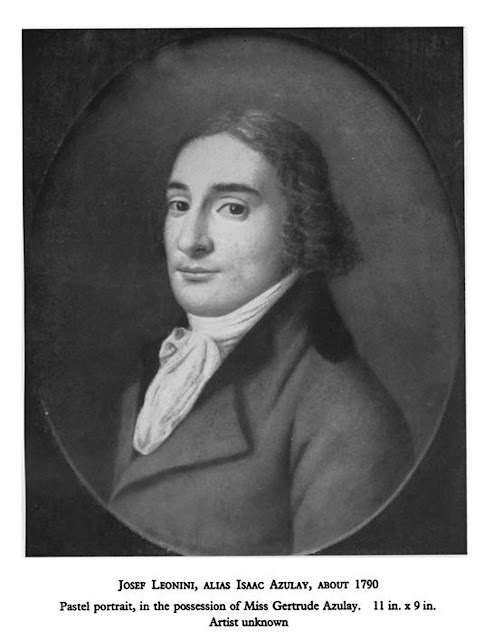 Giuessepe Leonini Azulay (1767?-1840), was the eldest son of H. Raphael Isaiah Azulai, who was himself the eldest son of H. Haim Joseph David Azulai (1724-1806), known as חיד"א.
Signor Yitzhak Leonini Azulay, M.A. Member of several Learned Societies, etc., etc. The portrait was made in 1790, which would make him about 23 years old. His name Giuseppe, or Joseph, would seem to indicate that he was named for his grandfather, but actually his שם קודש was יצחק ליאן. The information from this post was obtained from R.D. Barnett's paper "Isaac Leonini Azulay," ("in collaboration with Gertrude Azulay, A. Schischa and Jacob Jacobson") in the JHSE 19. Incidentally, Barnett shows that he probably wasn't born in Livorno (i.e., Leghorn, as on the tombstone) but in Jerusalem. He quotes "Dr. Johnson that ‘a man in lapidary inscriptions, is not upon oath’." The Vilna Gaon's grammatical prowess questioned and defended. Look at how the letters are signed! Near the central raised platform was a group of enthusiasts, among whom Froom Karlkammer, with his thin ascetic body and the mass of red hair that crowned his head like the light of a pharos, was a conspicuous figure.
" To you be peace, Pinchas!" replied Karlkammer. "Ah!" went on Pinchas. "Sweeter than honey it is to me, yea than fine honey, to talk to a man in the Holy Tongue. Woe, the speakers are few in these latter days. I and thou, Karlkammer, are the only two people who can speak the Holy Tongue grammatically on this isle of the sea. Lo, it is a great thing we are met to do this night — I see Zion laughing on her mountains and her fig-trees skipping for joy. I will be the treasurer of the fund, Karlkammer — do thou vote for me, for so our society shall flourish as the green bay tree." Karlkammer grunted vaguely, not having humor enough to recall the usual associations of the simile, and Pinchas passed on to salute Hamburg. I saw elsewhere that on the occasion of Moses Montefiore's 100th birthday, "Mr. N. L. D. Zimmer sent a long letter in Hebrew, which contained innumerable quotations from the Bible, all commencing with the letter ק." However, does anyone have the complete explanation as to why the Gaon would seem to state that as a rule לילה is לשון נקבה?